The Stitchin' Sheep: Ground Whatleseed? My brother and sister-in-law recently spent a bit of vacation time in Australia. They had a great time roaming the city of Brisbane and its surrounding areas. Apparently, in their travels they stumbled upon some wonderful finds, which included a nice little yarn sale (a good vacation necessity), exotic foods, and excellent cappuccinos. They couldn't very well package up the coffee and ship it to me, but they did the next best thing. A little while after their trip, I received a surprise package in the mail. It contained some lovely wool yarn, all the way from Switzerland. So, the yarn traveled from Europe to Australia, then over to the US and then, finally, back on over to Europe again. We're happy to have it back home. As a way of celebrating its homecoming, I believe it may become a Christmas gift scarf for someone in my family. Along with the yarn there were two cute little stuffed animals for the lambchops. A sweet little koala and its friend the wallabee, both decked out in Outback-wear. And, all of it smelled of lemons. Why? Well, inside with these goodies, there were spices and funky Australian cooking stuff. The lemon scent came from some Lemon Myrtle. Then, there was some ground wattleseed. Ground whatleseed? No, ground wattleseed. It smells a bit like coffee, and is apparently the seed from a species of acacia tree. They toast and grind it and use it to flavor all sorts of cakes and other yummies. It apparently adds a coffee/hazelnut flavor. I've yet to try it, but it sounds delicious. Incidentally, it's the main ingredient in the world famous? wattleccino (yeah, go ahead and google that, will ya?). Then, there was a huge roll of paper bark. 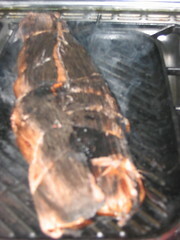 It is apparently used to wrap around meats or even veggies to give them a smokey flavor when grilled. This is really cool for me, because you can get that grilled flavor without even actually grilling over hot coals. I have one of those faux-grill stovetop pan things. I love it, as it nicely cooks steaks, fajitas and all kinds of good stuff without the hassle of starting a fire outdoors, which, depending on the time of year around here, can actually be dangerous as well. Eager to try this stuff out, I wrapped some trout filets in it. I had doctored them up with salt, pepper and some of that lemon myrtle powder. Delish. I'm telling you. If you've got a chance to get some paper bark, it's good stuff. I'll be needing some more of that when it's all gone, I think. I got a little picture of it smouldering for you. It's supposed to be black when the food is fully cooked. I suspect, though, that it wasn't supposed to catch fire from the fish fat dripping out the side. It really is a shame I didn't get a shot of that part, because it was quite spectacular. I was a tad bit busy clanging pot lids over the top to squelch the flames, though. You'll forgive me, I hope (and I can proudly say I didn't even lose my head in the face of danger). Good eatin'! Thanks B and J.